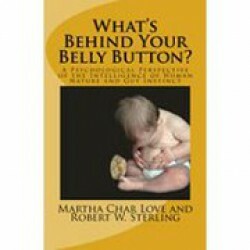 Although numerous books and articles have recently talked about the gut instincts as valuable in giving us useful hunches in the decision-making process, "What's Behind Your Belly Button?" goes much further and explains how gut feelings not only have a psychological intelligence of their own, but are also understandably rational in their functioning. The authors explore how gut feelings are like a gas gauge in our guts indicating through an emotional feeling of emptiness or fullness how well the two instinctive human needs for acceptance (attention from others) and of control of one's own responses (freedom) in our lives are being met and how our behavior attempts to keep these two instinctive needs in balance at all times. They explore how these two instinctive needs motivate nearly all our behaviors all through our lives and that the feeling memory of how well these needs are met from moment-to-moment may be accessed through somatic awareness of our gut feelings of empty and full by using the Somatic Reflection Process the authors have developed. "What's Behind Your Belly Button?" explains what your gut feelings are actually capable of telling you about your inner instinctive needs, how to listen to the voice of your gut, and how to use both of your brains--head and gut--to work together for your optimal health and well-being.